F&N Homes of Bloomsburg, Pennsylvania is a commercial modular contractor serving the Central Susquehanna Valley. F&N Homes has specialized exclusively in modular building for the past twenty-two years. Design flexibility makes modular construction the ideal choice for commercial construction. F&N Homes can build a prefabricated modular commercial building in almost any size and configuration. F&N Homes will work with you to determine the building that is right for your business. You can choose from a number of existing floor plans or custom design a building to your exact specification. Any modular building can be further customized with a wide range of choices for both interior and exterior features. Modular construction is an excellent way to provide attractive and customized space for the commercial environment. 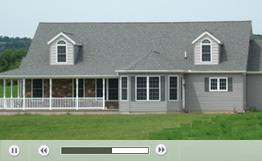 When you have a limited window of time for building, modular construction is the answer. According to industry sources, a modular building can be completed in about half the time it takes to complete a stick-built building. Modular components are precision built in a factory under highly controlled manufacturing conditions. There are no costly weather delays or material shortages to delay construction. Commercial modular construction is also cost-effective. Cost savings over traditional construction can range from 15 to 30%. A prefabricated modular building is built to be durable. Modular components must be built to withstand the rigors of transportation and lifting by crane. Modular construction is actually overbuilt, using approximately 30% more materials than stick-built construction. Modular components are precision manufactured by skilled laborers. The components are engineered to fit together perfectly, resulting in a building of extraordinary structural integrity. If you are considering building, consider the many advantages of modular construction. Send us a message or call us at 570-752-2440 to set up an appointment. F&N Homes has the experience you need for quality, on time, and cost-effective prefabricated modular building.